Prepare to be transported by the Old-World Mediterranean flavor and atmosphere of West Virginia’s most beloved Greek restaurants. From authentic souvlakia to perfect stuffed grape leaves, these places will craft up all the classics. Here are the 10 best Greek restaurants in the state. Serving delicious Greek and America food for breakfast, lunch, and dinner, John’s Café & Grill has authentic gyros, souvlakia, wraps, homemade soup, and desserts. With a cozy interior reminiscent of an Old-World seaside diner, your taste buds will thank you. Try the chicken lemon soup for a special treat. Looking for an authentic place that offers great Greek food? Theo Yianni’s Greek Restaurant in Weirton is about as good as it gets. The food is great and reasonably-priced. If this is your first visit to a Greek diner, they helpful staff and make recommendations in line with your favorite meat or flavors. You’re not just tasting good food, you’ll experience Greek tradition. Try the spanakopita or Greek lasagna for something special. In history, the Greeks gave us medicine and politics. Today, the Greeks in Morgantown, West Virginia gives us authentic and delicious Greek cuisine made with the freshest ingredients that represent that best flavors of the culture. From stuffed grape leaves to Greek fries, salads to gyros and everything in between, there isn’t anything on the menu that isn’t worth trying. You’ll be happy you did. If international food is your thing, then you have to stop by Grano, Charleston’s premier Italian-Greek restaurant. Everything is made from scratch and you can taste the difference. Kabobs, gyros, pizza pies, and some seriously good salads are always on the menu. All your senses will be part of this dining experience with the authentic flavors and festive colors that represent this part of the world. Taziki’s Mediterreanean Café in Morgantown was created from the desire to replicate the community gathering of people who love to celebrate life. Greek food is more than just something to fill an empty stomach. It’s the communication of everything that makes life good. With an interesting and traditionally Greek menu of flavors that will delight your taste buds, come with friends and celebrate life in a healthy way. If you’ve never had a gyro, you’ve not tasted good food. If you haven’t had a gyro from Ali’s Mediterranean Cuisine in Bridgeport, you haven’t tasted great food! 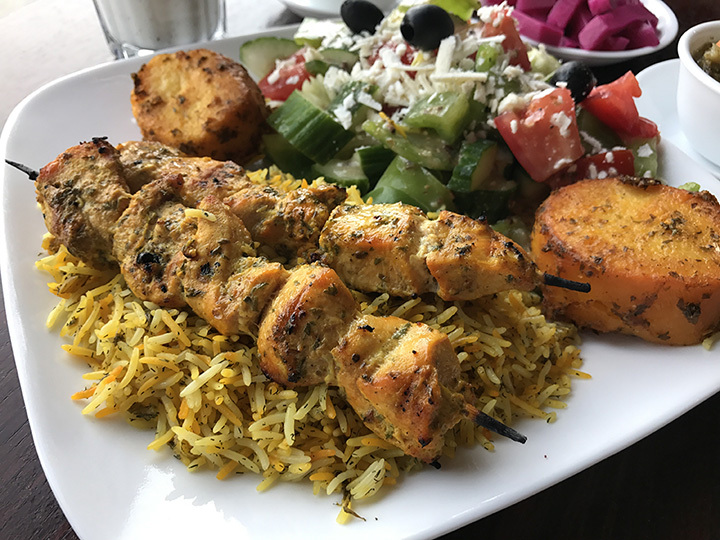 Serving the best in Greek and European food, Ali’s has awesome shish kabobs, tabbouleh, hummus, and falafel. Make sure to save room for baklava for dessert. Eating at Olive Tree Café in South Charleston is like stepping into another world. With authentic Mediterranean items like baba ghanoush and pierogies, they have signature dishes like olive-marinated steak with garlic sauce- pickles, and tahini served on pita for really large appetites. Even if you’re not new to Greek food, you have to try their version of baklawa—flaky phyllo dough with a sweet pistachio filling and rose water-infused sauce. If you’ve never been to Greece or that part of the world, Best of Crete in Charleston will give you an authentic taste of the food there. With popular favorites like stuffed grape leaves, salads that feature feta cheese and olives, and gyros full of shredded beef or lamb, lettuce, onions, tomatoes, and a yummy cucumber sauce that will make you want to lick your fingers, there’s no reason not to plan a trip there soon. You won’t have to find the secret lair of bandits to experience good fortune, but Ali Baba is the key to a great dining experience. Located in Morgantown, West Virginia, this Ali Baba is a Mediterranean/American restaurant that leaves people talking about pita bread, falafel, kabobs, and other traditional cuisine. Want to try a little of everything? Check out the lunch buffet during the week. Don’t let this simple casual eatery fool you. Chams Lebanese Cuisine in Parkersburg is a surprisingly good place to try a variety of Mediterranean dishes like tabouli, kebobs, cabbage rolls, and pita wraps. Serving great lunch and dinner foods, it won’t be hard on your wallet either.